“The Writers Group . . . is the highlight of my week. Pam provides a safe and sacred environment for us with her clarity, authenticity, humor and calm presence. … S. B. Writer, artist and certified yoga teacher Pam Roberts facilitates Spirit of the Written Word writing workshops for new and experienced writers. Mainly offered to people touched by cancer or loss, Spirit of the Written Word workshops foster a safe and supportive environment where writing becomes a tool for healing and a means to connect with ourselves and others. The format of the workshops derives from the work of Amherst Writers and Artists, developed by Pat Schneider and taught to Pam by her mentor, writer and long time writing workshop leader, Genie Zeiger. Pam happened to be a member of Genie’s writing group more than 20 years ago when she was diagnosed with breast cancer, and she found that writing in the safe workshop setting was a critical part of her healing process. Under Genie’s guidance, Pam first began leading Spirit of the Written Word writing groups for cancer survivors in 2003. Studies have shown that writing can be therapeutic when confronted by a challenging situation such as cancer. Our creative expression in the workshop setting can help transform pain and grief and bring deep meaning and relief. The workshops for people affected by loss and by cancer (survivors may bring an accompanying loved one) are grant-supported and offered for free. The Spirit of the Written Word workshops for general populations have a charge. Please click on Current Workshops and Events below for upcoming programs. Pam is available for one-on-one writing consultations and to facilitate a writing group of your choosing. ~1 in 8: The Torso Project, the hands-on healing art workshops, exhibits and book for women touched by breast cancer. ~ Gentle Yoga for Cancer Survivors, an adaptive gentle weekly class that includes breathing and centering exercises; postures to increase flexibility, strength and balance; and a deep guided relaxation. 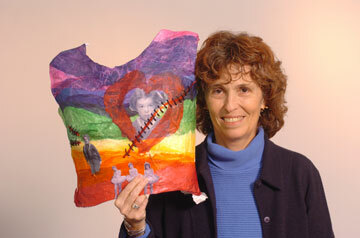 Pam is holding a torso from One in Eight: The Torso Project.